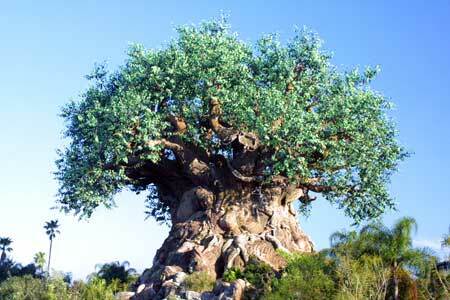 Inside the base of the Tree of Life is the theatre that houses the 4-D showing of “It’s Tough to be a Bug”. After all, bugs do live in trees, right? Guests follow winding paths around the Tree of Life where you can take your time and enjoy trying to spot the 325 creatures. Most of the queue area is unshaded. Upon entering the Tree of Life, guests are given 3D “bug” glasses that should not be put on until you are seated in the inside theatre. The walls of the pre-show area are lined with posters of past shows that the Tree of Life Repertory Theatre Players have performed in. Guests will notice such classics as “A Stinkbug Named Desire”, “My Fair Ladybug”, and “A Cockroach Line”. Every 8 minutes, visitors are escorted into the 430-seat theatre where they put on the 3D glasses and begin the fun. Hosted by Flik from “Bugs Life”, with an appearance by Hopper, guests are made honorary insects. A good natured ant introduces you to some of his friends. What follows is a fast paced adventure with some surprising “4-D” effects. The theatre is wheelchair accessible. There are assistive listening devices for hearing impaired guests. For deaf guests, reflective captioning is available, ask a Cast Member at the entrance for details. There are currently 0 reviews for It’s Tough to be a Bug. Be The First To Review It’s Tough to be a Bug! You can also search for It’s Tough to be a Bug specific threads! It’s Tough to be a Bug Tips! On hot days, mister fans can provide respite from the heat. A warning to parents, some of the special effects may be too intense for small children. It may be best for an adult to experience this before bringing small children in to see it.